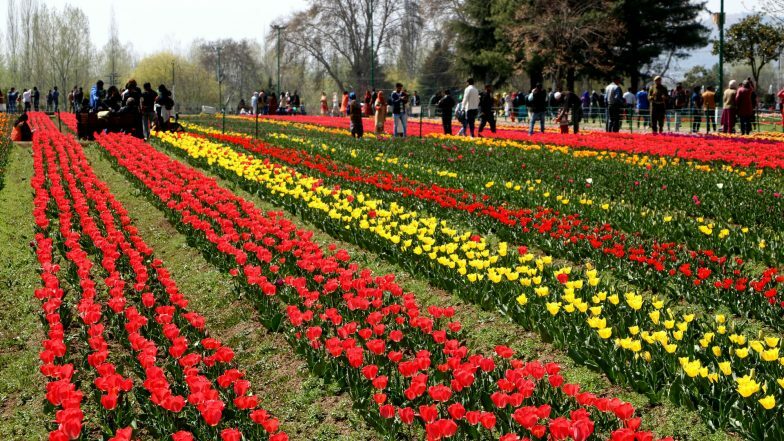 Srinagar, April 1: The famous tulip garden in Jammu and Kashmir's Srinagar opened for visitors on Sunday. Known as Asia's largest tulip garden, it has over 12 lakh tulips of 51 varieties, all in full bloom these days. Asia's Largest Tulip Garden on the Banks of Dal Lake in Srinagar Open to Visitors. In addition to tulips, flowers of other varieties like daffodils, hyacinths and ranunculus are also grown in the garden. The garden, which is spread over 30 hectares of land, is situated in the mesmerizing foothills of the Zabarwan hills on the banks of the Dal Lake. The opening of the tulip garden marks the beginning of the tourist season in Kashmir. Over 3,000 people, mostly locals and some tourists, visited the garden on Sunday. Tulips of different colours dot the vast area of the garden that creates a semblance of similar spectacles seen in Holland that is famous the world over for its majestic tulips.